With ebooks gradually taking over the world, one cannot but join the flow. Indeed, ebooks help you save same physical space and give an easy access to world’s library. However, although you don’t have to pay for hardcovers, you still have to invest some money in your digital library unless you download ebooks for free. There are lots of resources that offer thousands of ebooks for free, and the only thing you need is a decent ebook reader app to open and read them. Icecream Ebook Reader is an application that offers you not only read ebooks but also manage your library in a convenient way. 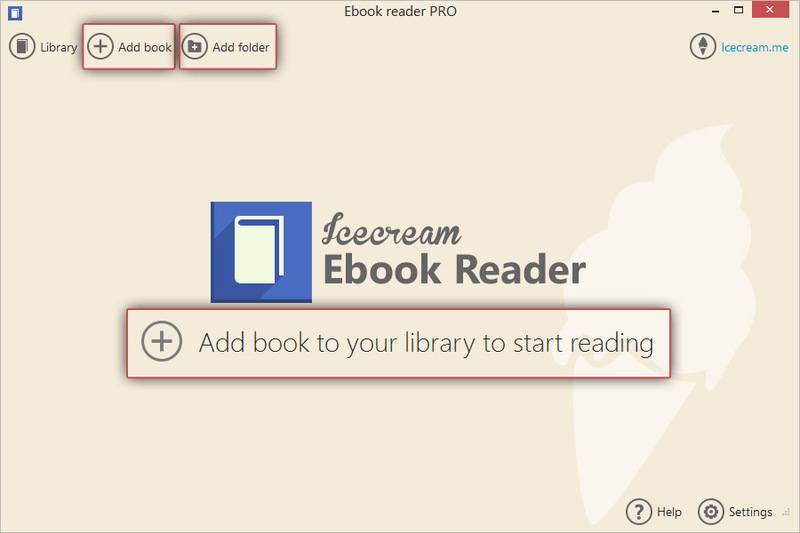 Read on to learn more about how to download ebooks and read them with Icecream Ebook Reader. First of all, prepare your computer for reading ebooks by downloading Icecream Ebook Reader from this website. You’ll be suggested to save an installation file – do that and run it to start the installation. The Wizard will guide you through the process and help you complete the task in less than a minute. On the completion, launch the application to start creating your digital library. Visit one of the websites that offer ebooks in EPUB, FB2, MOBI, CBZ, CBR or PDF formats. There are paid resources where you can purchase ebooks and free ones like Project Gutenberg or for example torrents. Follow the chosen website’s instructions to download ebooks that you like and save them on your hard drive. Note that none of these books will be opened by default, but with Icecream Ebook Reader preinstalled, you would be able to open and read any books in the mentioned formats. Click the “Add book to your library to start reading” button under the program’s logo. Windows Explorer will be opened, and you can browse your hard drive to find previously downloaded book. You can also use the “Add book” button in the upper left corner of the program's window. Right next to this button there's a “Add folder” button that helps to add whole folders with ebooks to the program's Library. 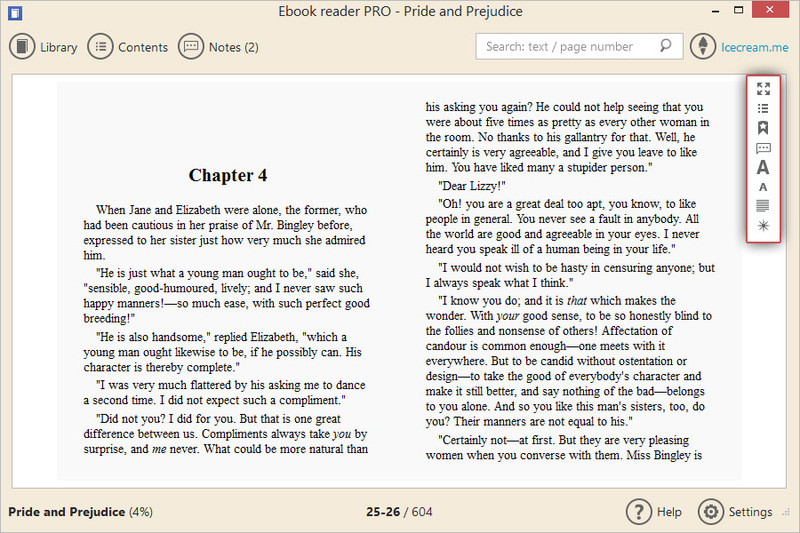 Icecream Ebook Reader supports drag and drop mechanism, so you can just drag and drop the ebooks into the program's window to add the files to the Library. You can access all the added books by clicking the “Library” button in the upper left corner of the main window. All the books that present in the Library can be displayed in a form of a chart or a book shelf with books' covers thumbnails – click the icon right above of the working area to select a desired view (Table view or Bookshelf). The chart contains information about a book’s title, author, progress, date of addition, number of notes added to the book. Menu at the left side of the window helps you to check your recently read books (Recently Read) or all books (All), and also check the Favorites (you can mark a book as favorite by clicking a little star icon to the right of the book's title in the chart) and available formats (EPUB, MOBI, FB2, PDF, CBZ and CBR).You can also add custom categories for the most effortless and convenient books organization by clicking the “Add new category” button. New categories will show up right below the list of the formats of the ebooks added to the Library. The “Deleted” folder contains the ebooks that were deleted from the Library. You can restore the books to the Library or permanently delete them. To delete a book from the library, click a recycle bin icon in the rightmost column of a chart. Click the “Settings” button in the bottom right corner of the main window. It will bring you to the Settings panel where you can configure the program's settings. You can read more about it here. 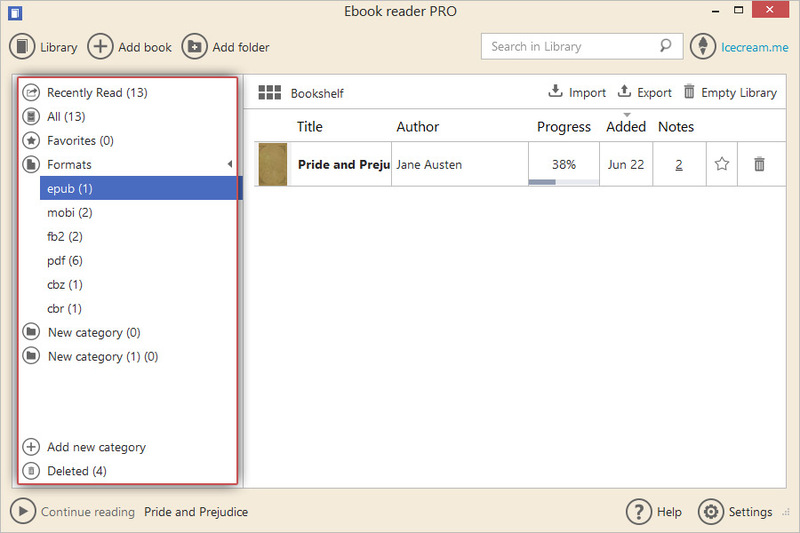 Now, when you successfully downloaded ebooks and prepared them for reading, double click the book in the table if you are in the Table view mode or a thumbnail if you are in a Bookshelf mode. You can also use a search box in the upper right corner to find the right book in the Library. The content will be displayed in the window immediately in the reading mode – click the right or left sides of the window, “Left”/“Right” keys on your keyboard, or Space and Backspace keys to turn the pages. Take a look at the toolbar at the right side: you can use the tools to switch to a full screen mode, go to the table of contents and list of bookmarks, bookmark a page, open the Notes panel, make the font smaller or larger, and also change the page view and profile.